Kindred Hospital, and before that the East Department of the East Houston Hospital. It has been run by Southwest Key Programs as a shelter for undocumented children for several years. As debate rages endlessly in the nation about the federal government policy of separating children from their parents who entered the county illegally, the debate has now moved to the Houston political stage because the state’s largest provider of these services has requested a permit to use a building at 419 Emancipation Avenue on Houston’s east side. Southwest Key Programs is the largest provider in Texas, now housing 2,725 unaccompanied children in 16 locations. This includes 4 facilities in the greater Houston area that are virtually unknown and unnoticed, including one that dates back to 1991. Two of these are in the North Channel/Northeast circulation area. Casa Montezuma is on the I-10 Feeder road in the Channelview area. Neighbors had suspected that the facility was a federal children’s shelter, but weren’t sure, they told this newspaper. Records from the Texas Health and Human Services show that the facility is currently housing 191 children, and recently had its license increased to 210, an increase of 11% similar to figures statewide. This shelter is licensed to provide child care services only, since May 2017. Children housed are from 10 to 17 years of age. 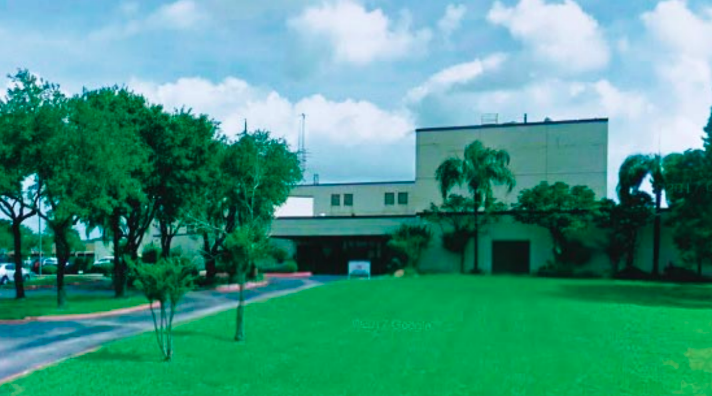 The other facility in our area is at 7900 Mesa Drive, in Northeast Houston. It houses 54 children, ages 10 to 17, and is licensed for multiple services, including Emotional Disorders. It has had a license from the state since 1991. Most of the Texas shelters are run by two nonprofits: Southwest Key Programs and BCFS Health and Human Services. The latter is a church sponsored group, based in Dallas. increasing the opening for ships to pass through from the existing 750 feet to 1,320 feet. East Harris County – June 26, 2018 — Harris County’s largest-costing single project in history is underway along the Sam Houston Tollway, between Highway 225 in Pasadena and I-10 in the North Channel area. The Harris County Toll Road Authority (HCTRA) is overseeing the project, with a cost of $1 billon. The massive project, which began in April, will be paid for from toll revenues and without an increase in the $1.50 toll bridge fee county officials said. The new bridge, projected to open in 2024, will have 8 lanes (4 in each direction), full shoulders, no bridge supports in the water, and no reduction of lanes during construction. The Port of Houston has been working to widen and deepen the navigation channel for several years. 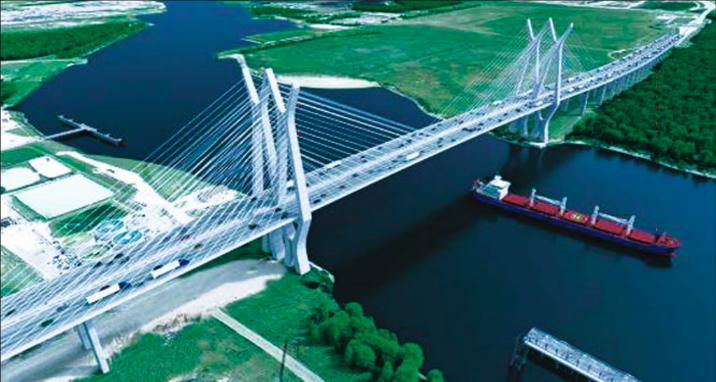 The new cable-stayed bridge will look similar to the Fred Hartman Bridge. HCTRA says the addition of inside and outside shoulder lanes and a gentler slope will make the new bridge safer. Commissioner Jack Morman at North Shore Rotary Club meeting talked about the upcoming bond election for flood control. 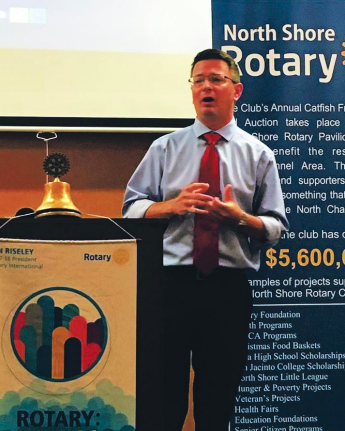 NORTH SHORE, Texas – Last Thursday, Rotary Club of North Shore welcomed Country Commissioner Jack Morman as guest speaker at their noon luncheon. Comm. Morman talked to the Rotarians about the proposed bond to deal with flooding issues. A $2.5 billion dollar bond is proposed by the Commissioner’s Court and this meeting was to help convince locals that there is a need in the Jackson Bayou vicinity, that is to get some flood control measures and addressed the down stream of the San Jacinto River Watershed. The bond election is to be held August 25 – the one year anniversary of Hurricane Harvey’s landfall. Early voting is to begin August 8th. It is to address Harris County’s most prevalent natural disaster. The total need in the county for flood risk reduction is about $25 billion, and the $2.5 billion of this bond will provide matching funds to enable the H.C. Flood Control District to leverage the federal Harvey-related disaster funding that is on its way to Harris County. The cost to taxpayers would be spread over 10 to 15 years for an estimated 2-3 cents per $100 valuation. An over-65 or disabled exemption and a home worth $200,000 or less would not pay any additional taxes.